Do you ever feel like decorating projects take forever? 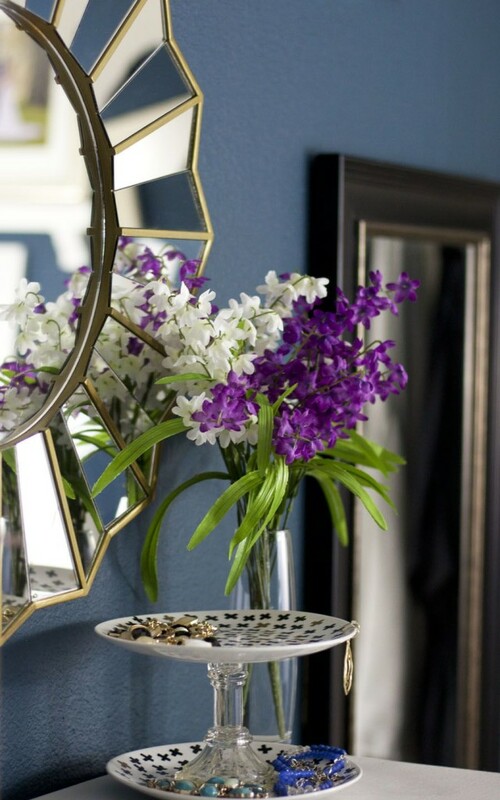 I often struggle to stay focused on just one room at a time, which results in a lot of rooms halfway decorated. If you’re the same way, you should totally challenge yourself to focus on one room for a few weeks and see how much of a difference it makes. For me, the difference is HUGE! 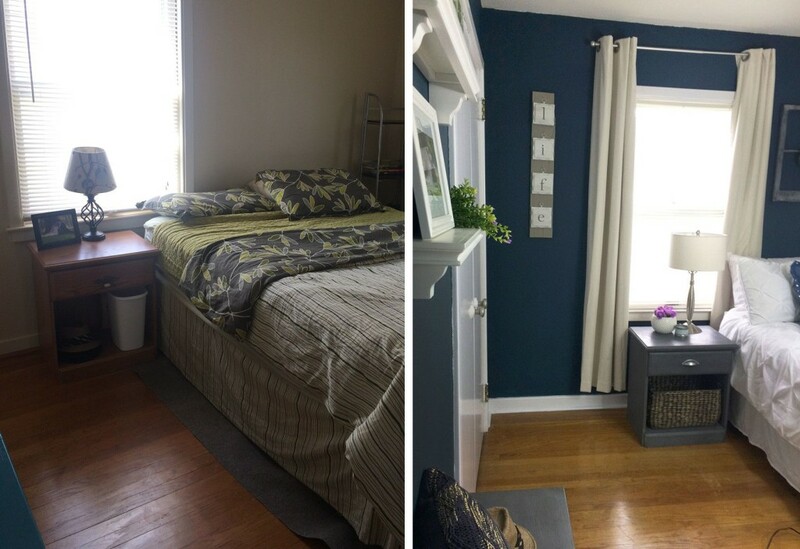 Just five weeks ago, I started the One Room Challenge and set out to transform our master bedroom from its hodgepodge, half-decorated state into a relaxing, decorated escape. Five weeks goes really fast when you only have evenings and the occasional weekend to work on things! But I love a good challenge and was determined to complete our bedroom makeover. I’m beyond excited to show you the result of my decorating focus. 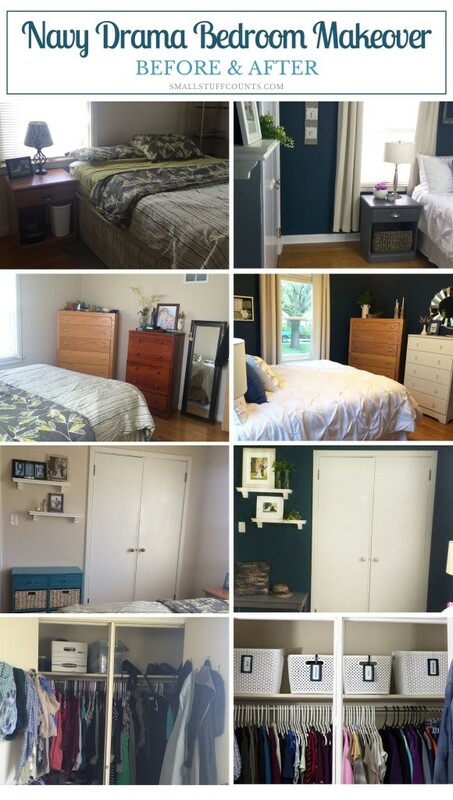 The before and afters are my favorite part of any room makeover, and this post is filled with them! 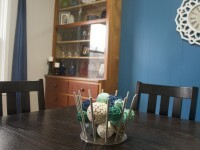 It’s amazing to me to look at them and realize just how much decorating I accomplished when I focused on this one room. I tend to have a gazillion projects going at once, which means that things take forever to get finished. So it’s nice to actually wrap up this room in a reasonable time frame. 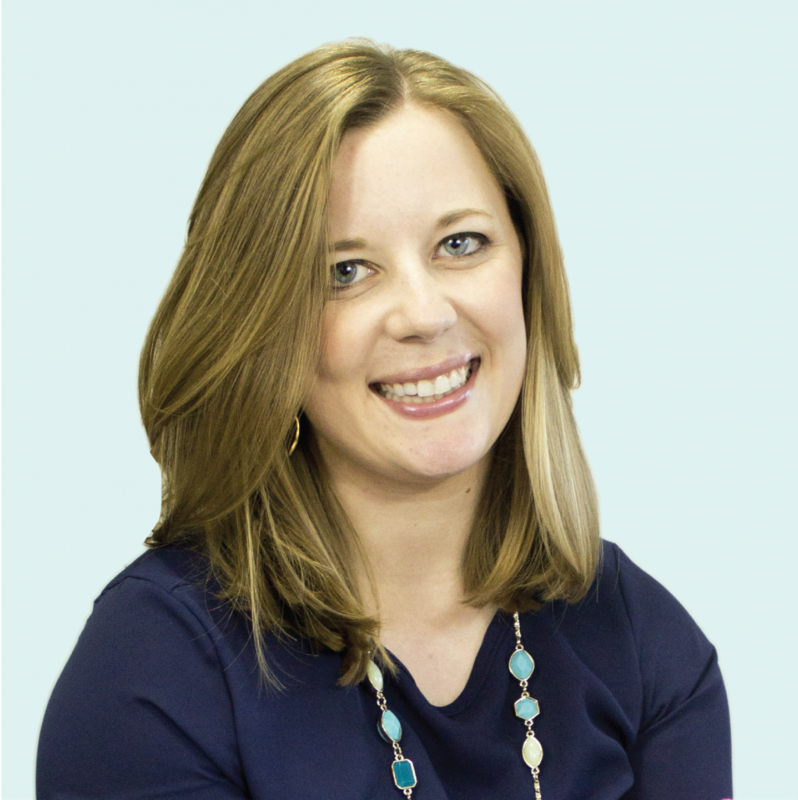 If you’re not familiar with the One Room Challenge, it’s hosted by Calling It Home each spring and fall and a couple hundred bloggers usually participate. The challenge is to completely make over one room in five weeks. All the bloggers share weekly progress updates, and then today is the day when we all reveal our completed rooms. So there are a lot of room tours in blogland today! Here’s a quick look at the original state of our bedroom. I hadn’t spent any time on it since we moved into our house about a year and a half ago, so it definitely needed some sprucing up. There wasn’t anything horribly wrong, but it felt far from complete. The basic furniture was all in good shape, and I knew I could make everything look more polished with a good color scheme and some paint. 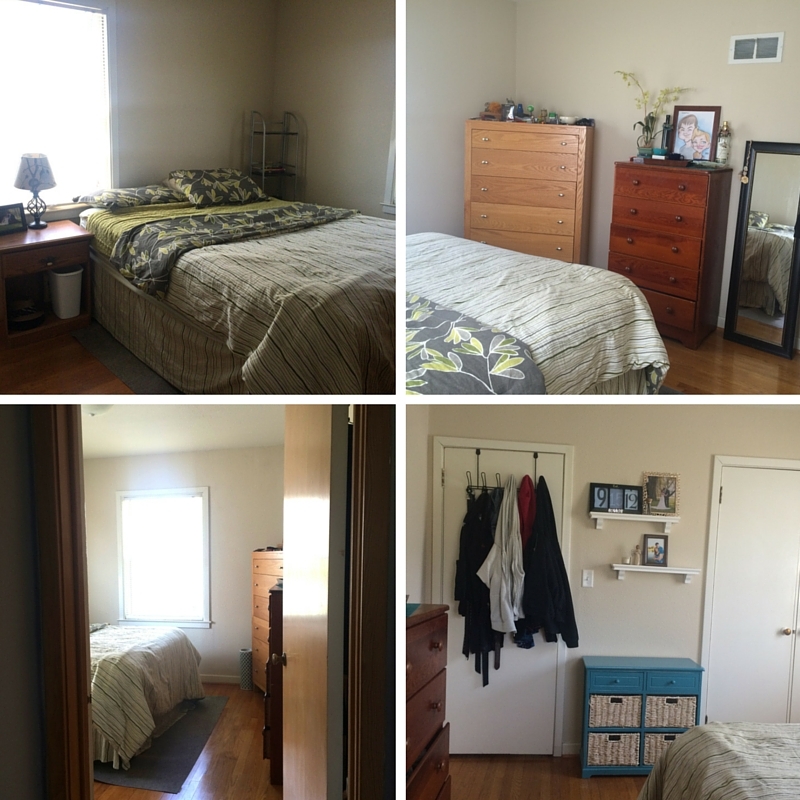 Check out our bedroom! It feels brand new and has become such a relaxing place to retreat to in the evenings. This post contains affiliate links for your convenience. See my disclosure here. 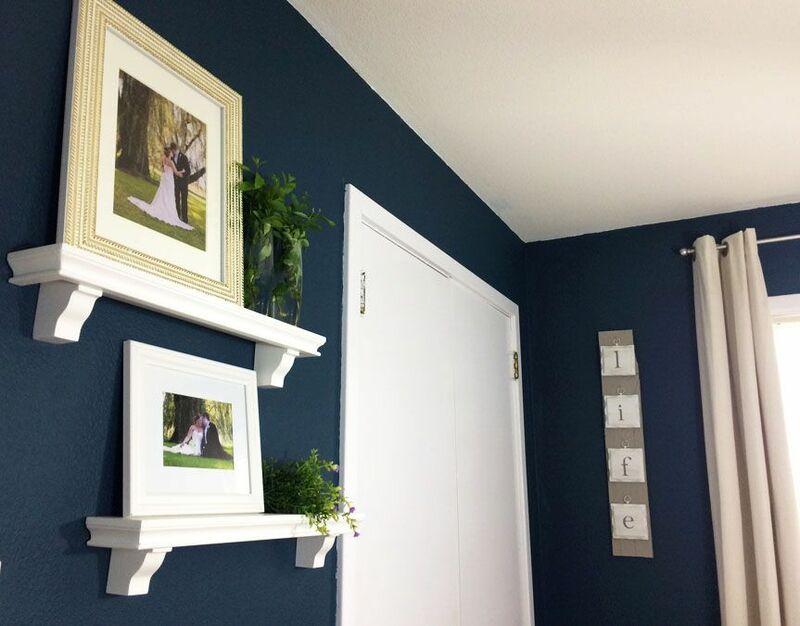 The walls are a beautiful shade of navy and the trim and closet doors are crisp white. The bland beige is completely erased from this room! 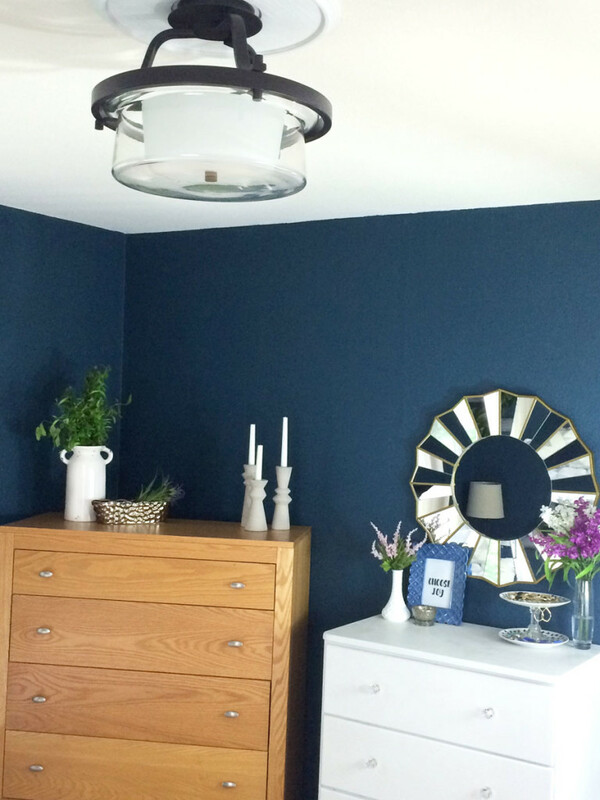 I use Valspar’s Night Swim color and am so pleased with it. 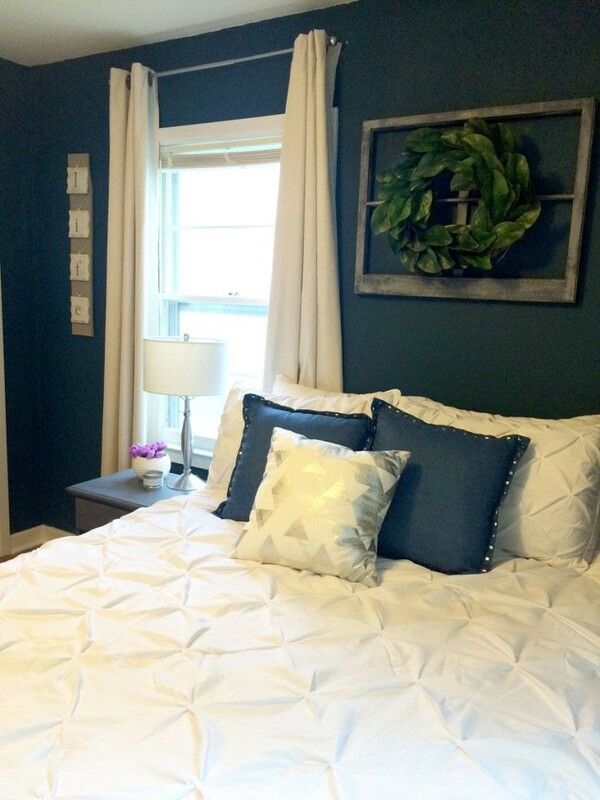 I love this beautiful pin tuck white comforter I found at a ridiculously low price. We’ve had it for a month now, and it still looks gorgeous. We treated ourselves to these new white sheets from Target, and I am very happy with how soft and silky they feel. The subtle pattern is a nice touch. I found a couple blue pillows at Gordmans, a place I only stopped in by happenstance. They have a pretty nail head type embellishment on the edging. Here’s the link to the same pillow on Amazon, although they were quite a bit cheaper at Gordmans. I was working diligently on a headboard this past week, but threw up my hands in DIY defeat a couple days ago. Some DIY projects just aren’t meant to be, right? I still want to add in a headboard, but am going to save that project for another day. I needed something to hang above the bed, and ended up relocated the thrifty magnolia wreath and vintage frame that I created last week. Although I didn’t intend to hang the wreath in this room, I really like how it looks. One big thing we wanted to improve in our bedroom was the window treatments. We had cheap mini blinds up, which didn’t block nearly enough light in the mornings. So we opted for neutral cream color Eclipse blackout curtain panels. They have a soft canvas look to them and keep the room nice and dark while we’re sleeping. Those two shadow boxes to the left of the window (above photo) are items from our wedding day. I made them a long time ago and hadn’t yet found a place for them since we moved into our house. 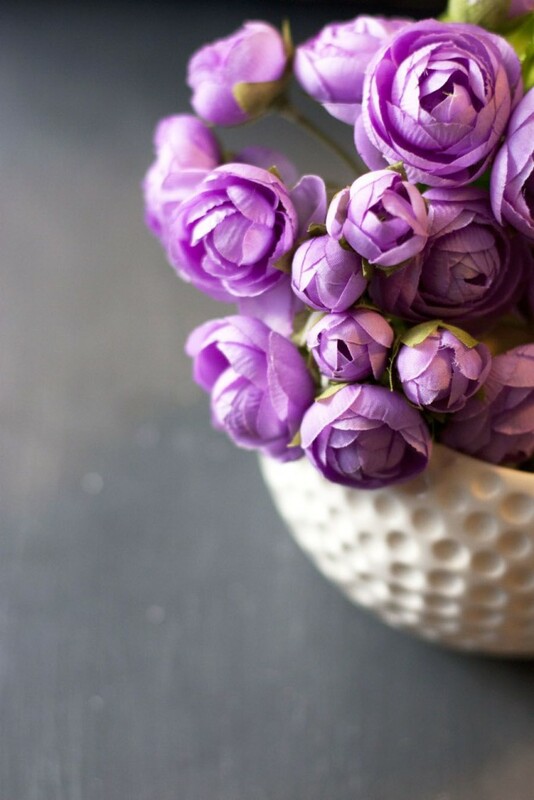 Bedrooms are a great place to decorate with sentimental items. 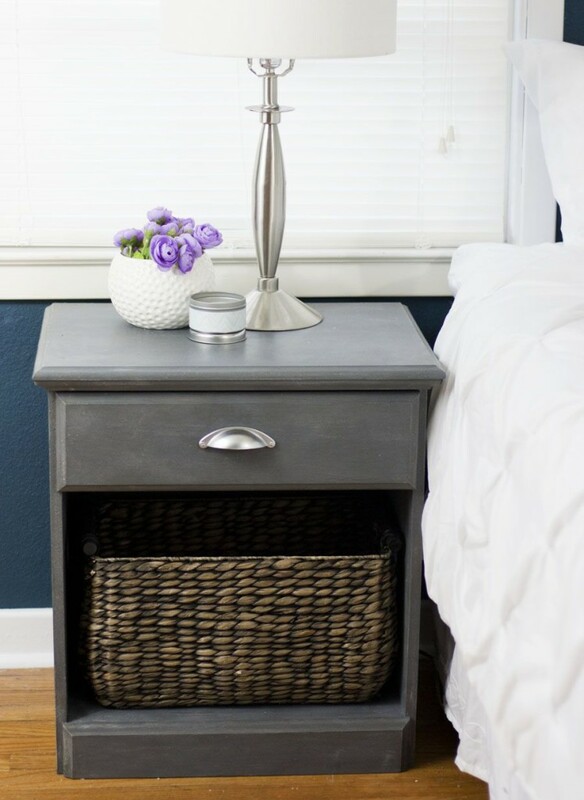 The grey nightstand turned out so gorgeous! Much prettier than the cheap pine nightstand it was previously. 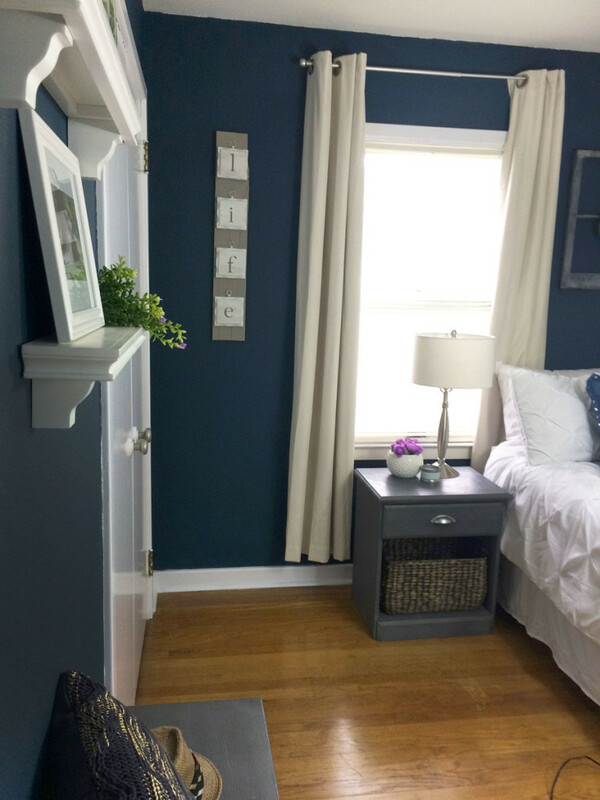 It looks so sharp and refreshed with a coat of this dark grey chalk paint. The nightstand in the corner to the right of the bed is made up of two crates stacked on top of each other. 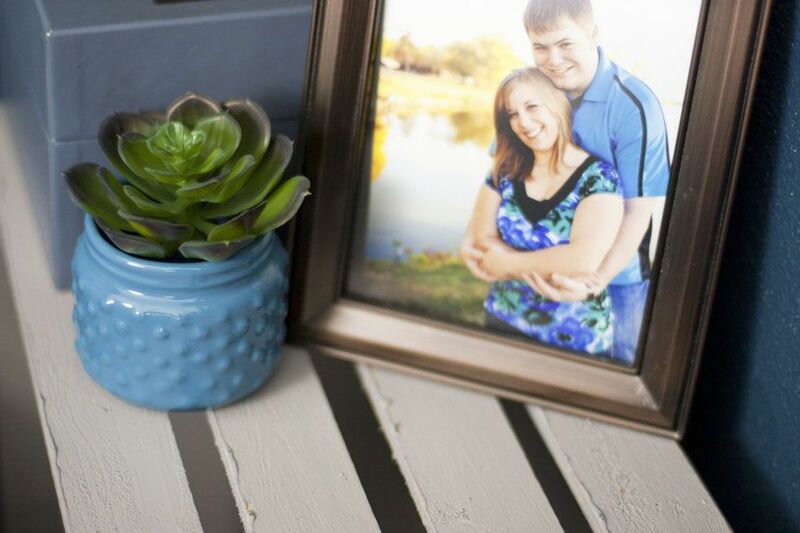 I didn’t have a lot of room to work with square footage wise or in my budget, so these were a great solution since I already had them on hand. 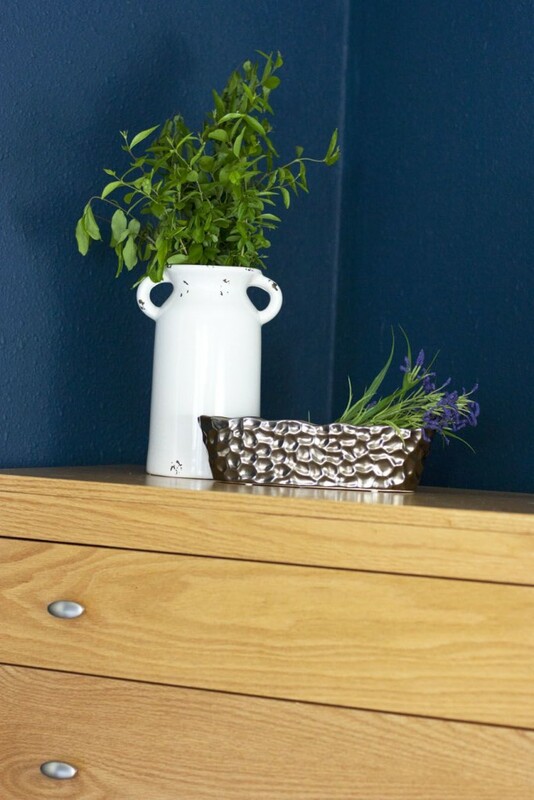 Ooh, I have to point out that adorable blue jar and succulent. I came up with the idea to place it on my side of the bed to use as hidden storage. My nightstand typically has lots of hair ties and bobby pins all over it, so my plan is to lift up the artificial succulent and drop my hair accessories in the bottom of the jar at night. I think it will be an easy peasy way to keep them corralled and out of sight. 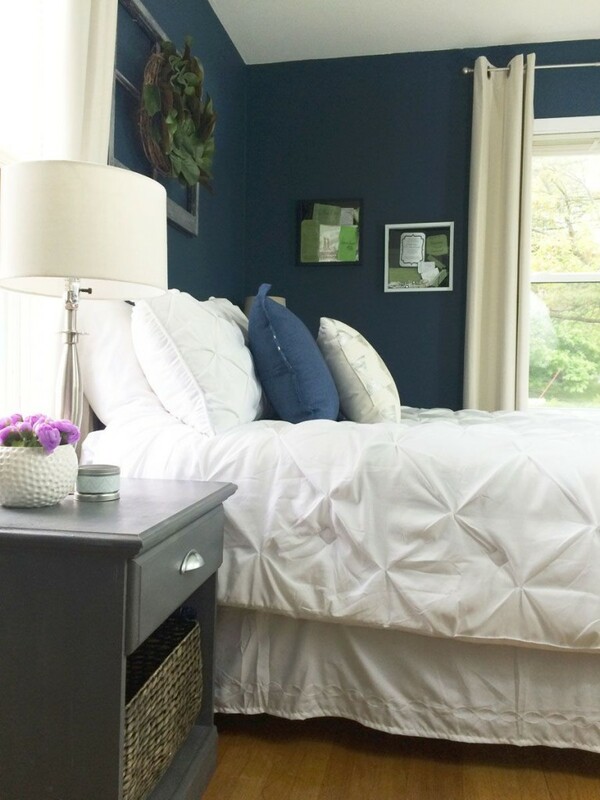 This light fixture from 1STOPLighting is such a perfect touch to the bedroom makeover. I love the name of this fixture: Indulge. 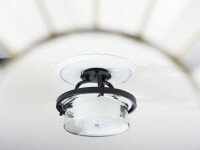 Here’s a close-up of the light fixture. Doesn’t it look beautiful? I’m going to elaborate on our light installation in a future blog post. 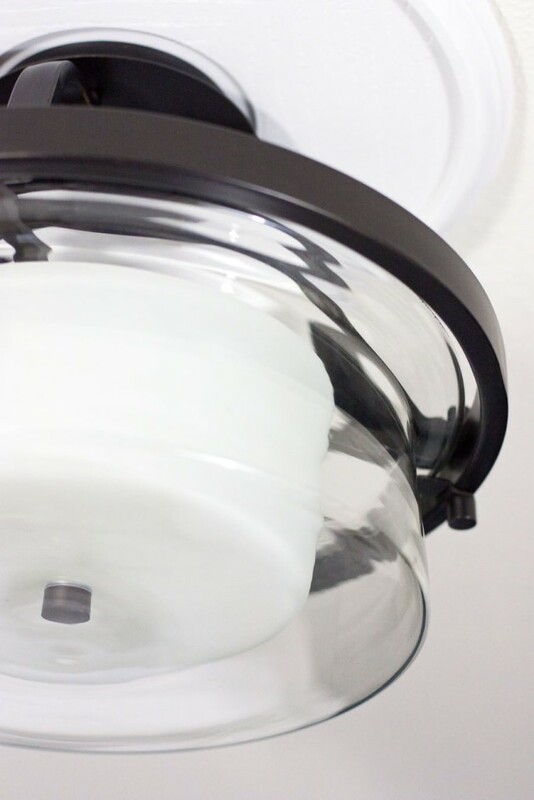 This was my first time replacing a light fixture, and I learned a lot! I really like the layered glass globes and the brushed metal. 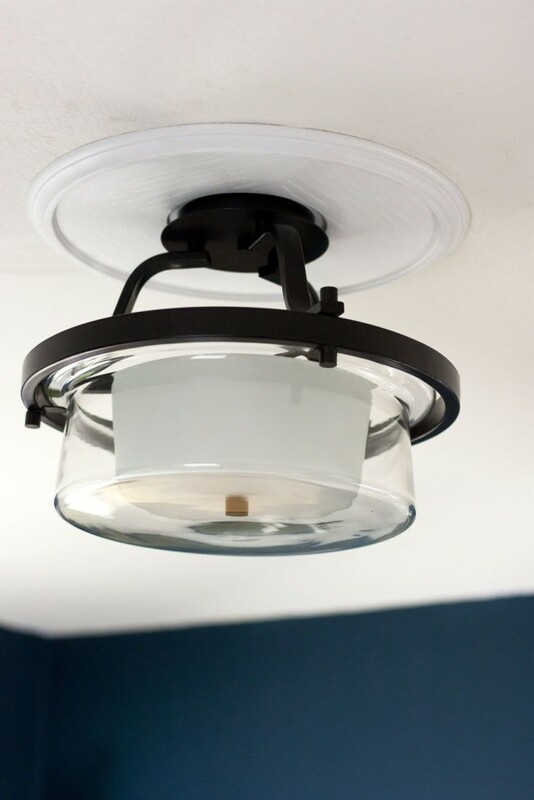 This light fixture has some great character, and I feel like it could easily transition into many decorating styles. My favorite view of the whole room is the top of my white dresser. 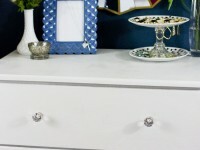 I painted my old pine dresser with this pretty white chalk paint. I had never used chalk paint before, but it made painting furniture much less stressful than I expected. 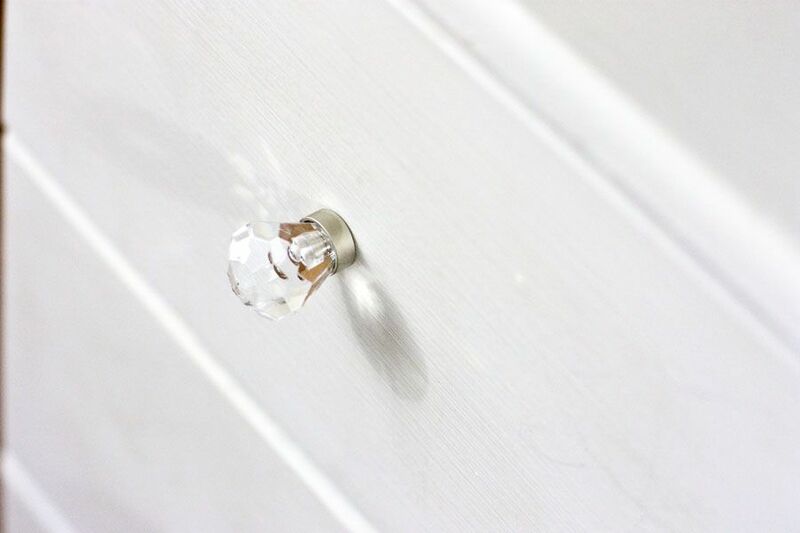 The finishing touch is the lovely diamond acrylic knobs from D. Lawless Hardware. 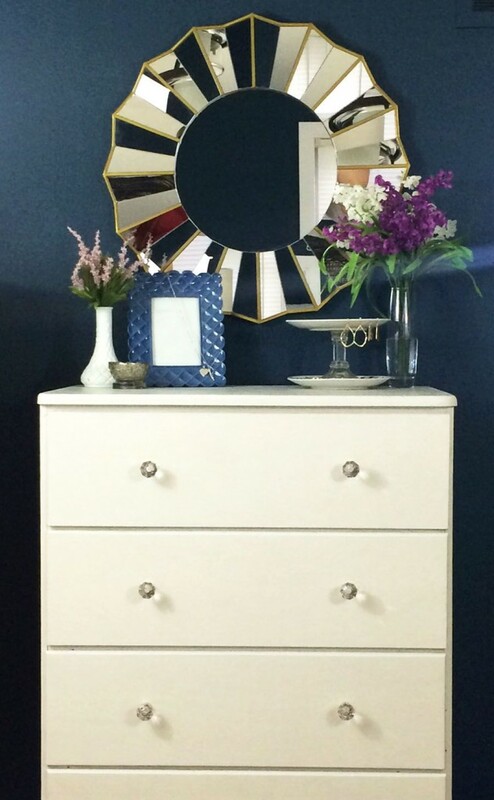 Read more about this dresser makeover here. 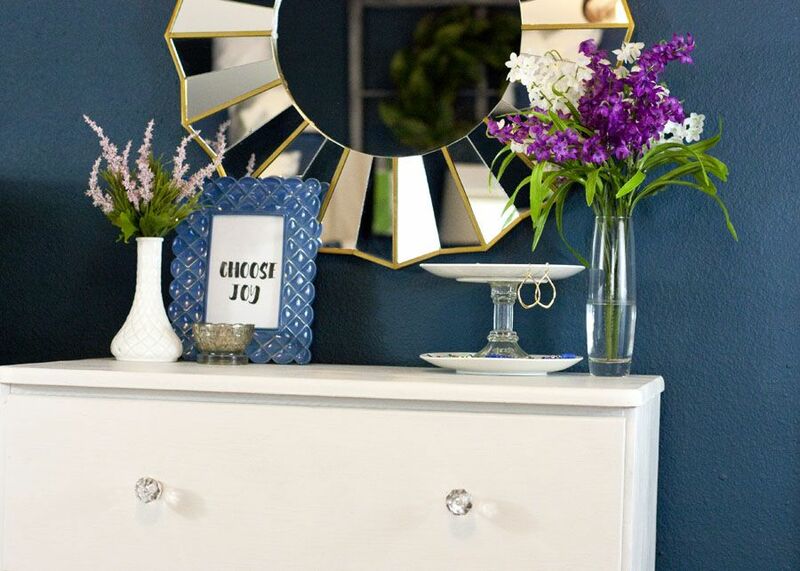 The flowers, frame and sunburst mirror were all found in clearance aisles at Hobby Lobby and Michaels, and that jewelry tray is a thrifty DIY project (tutorial here). Check out that gorgeous view of the top of my dresser! I love this photo. I was struggling to find something for the top of David’s tall dresser. It was tough to decorate since the dresser is at an angle. I ended up filling this white vase with clippings from the ugly bushes in front of our house. 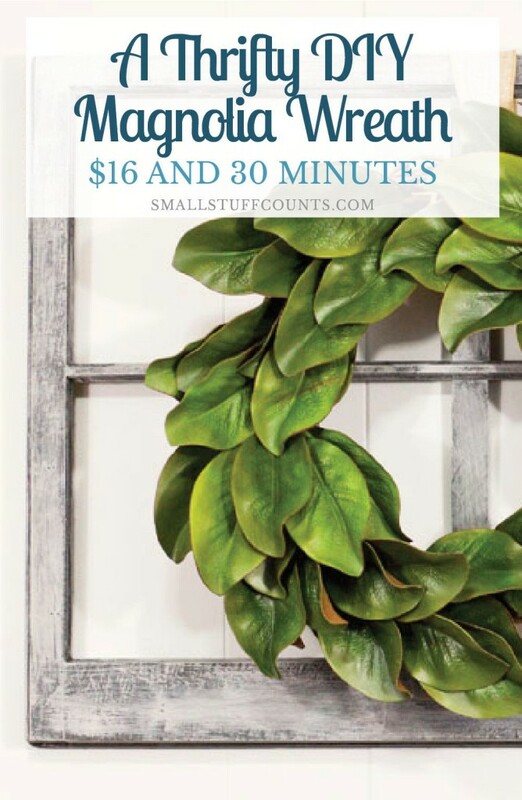 Those bushes are a bit crazy outside, but their branches look so great in vases! 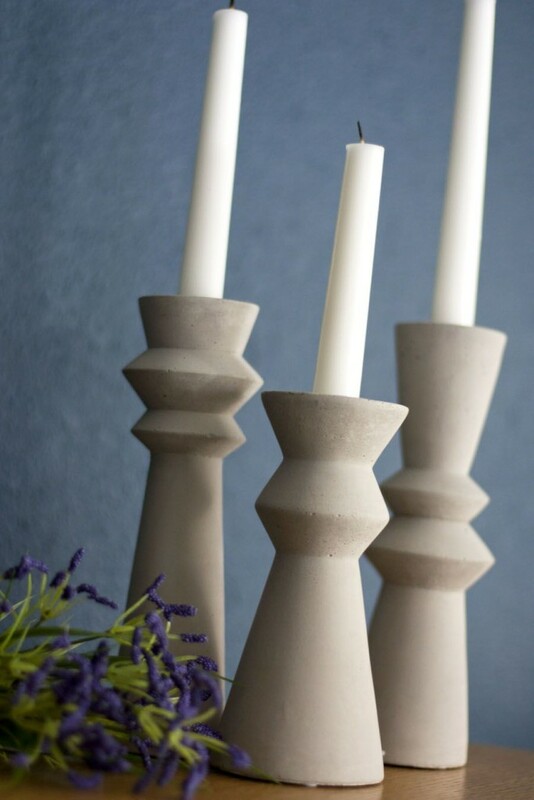 Check out these beautiful concrete taper candle holders. 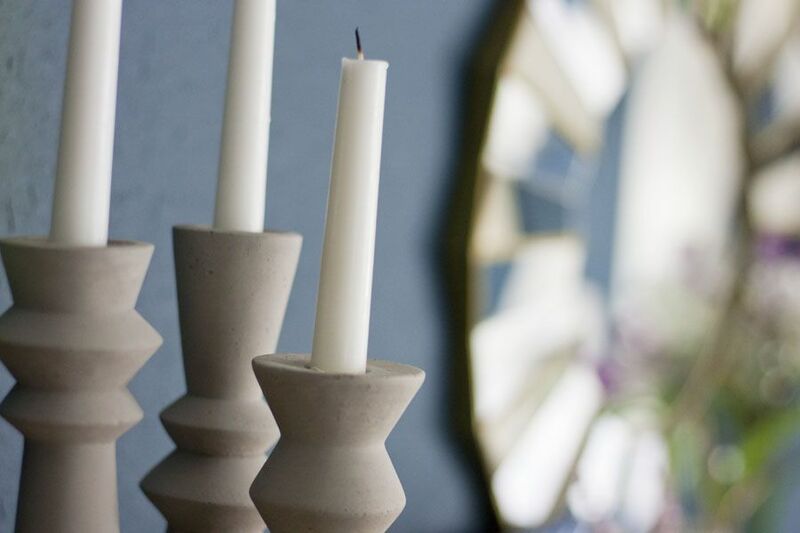 Merely Modern is an online boutique filled with pretty decor, and they sent me these candle holders to complete this room makeover. The concrete adds another element of texture to the overall look of this room. I adore this set of candleholders so much. 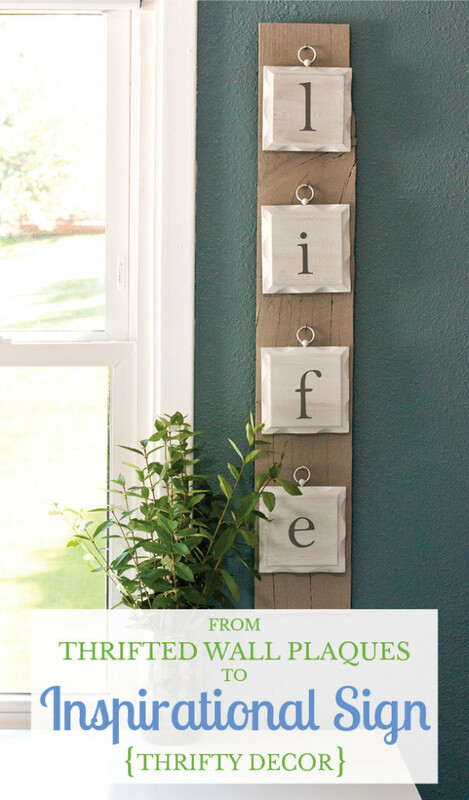 That ‘Life’ pallet sign on the right side of the closet was a DIY project I made a while ago. It’s made from some thrifted wooden plaque things, and the result was this pretty sign. See the details in this blog post. These white shelves fit so nicely between the closet doors to the right and the door to the hallway on the left. 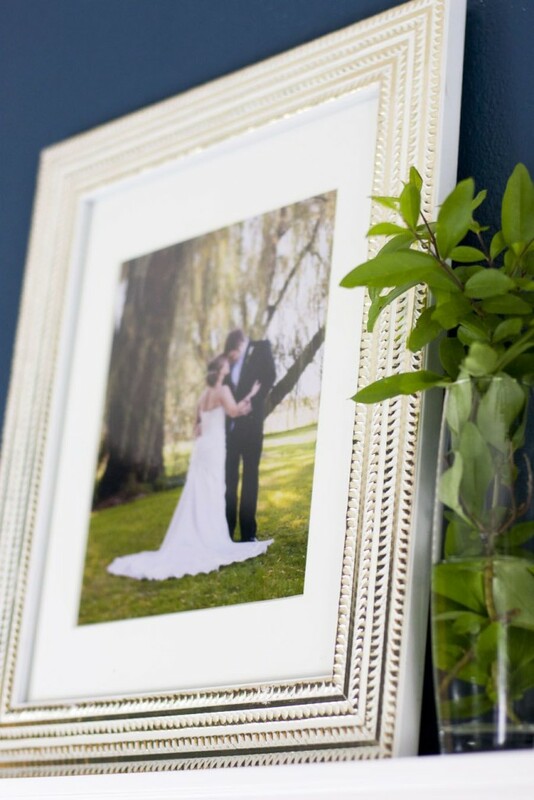 I found that giant white metallic frame on clearance at Kohls, rounded up a white frame I had and added some greenery to complete the look. The top two vases are filled with more clipping from the bushes in front of my house. You can’t beat free! Check out the piano bench I found for $10 at the thrift store! 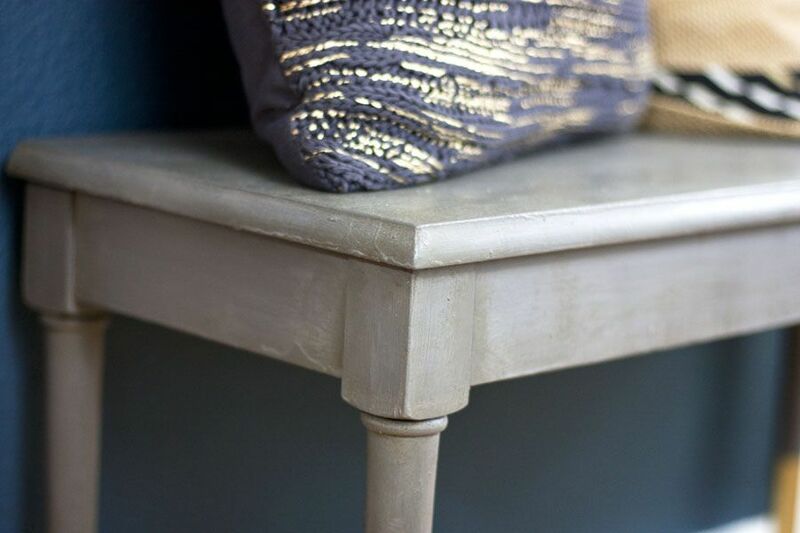 It was a classic pine and I gave it a new life with this dark grey chalk paint to match my nightstand. I painted the tips of the legs with gold spray paint. It fits perfectly on this little wall between the door and the closet. 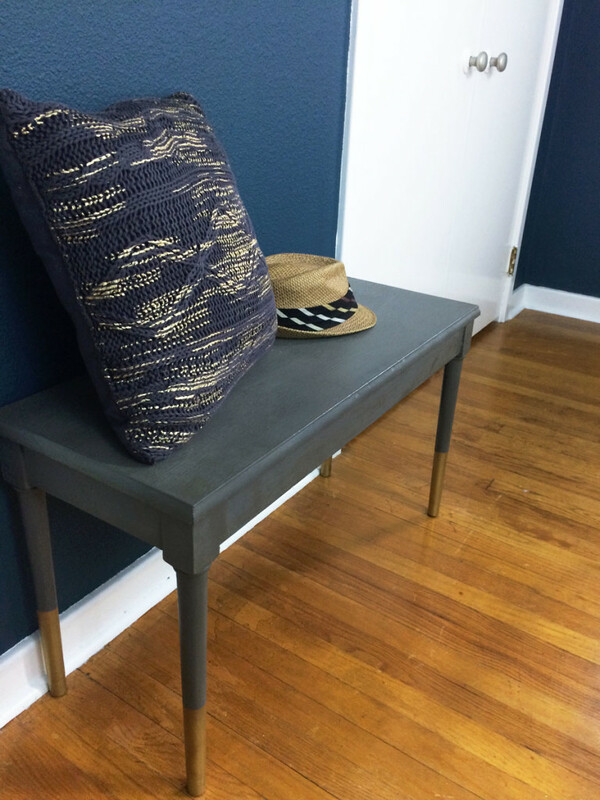 The full piano bench makeover tutorial is coming to the blog soon! And finally, let me show you our super organized closet! It’s so much better than before. I purged a ton of clothes, added some pretty hooks from D. Lawless Hardware, and filled the upper shelf with white storage bins. 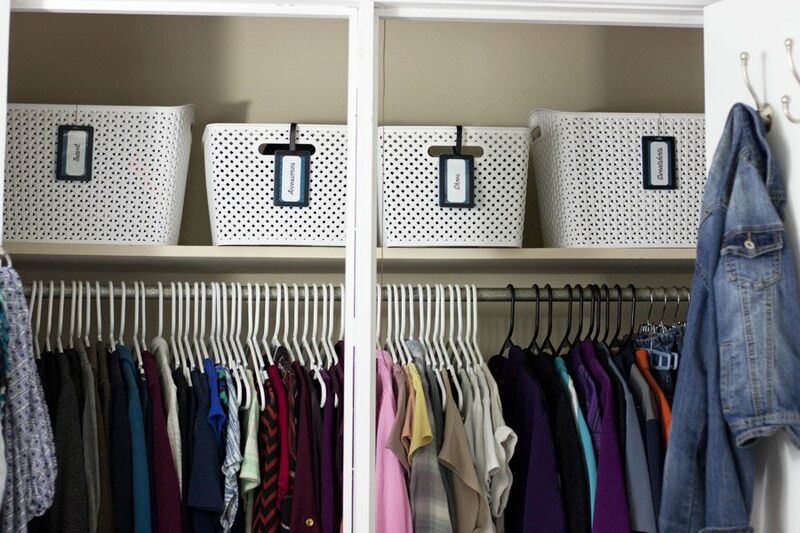 I have so much to share about our organized closet, so look for a future blog post on the subject. 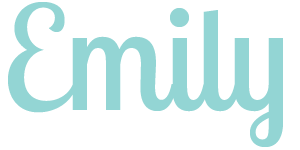 I did the whole thing following the KonMari method and look forward to sharing more with you soon. If you haven’t yet read The Life Changing Magic of Tidying Up, I’d highly recommend getting a copy! I am a sucker for a pretty basket with a label, and these just look so great on top of our closet shelf. 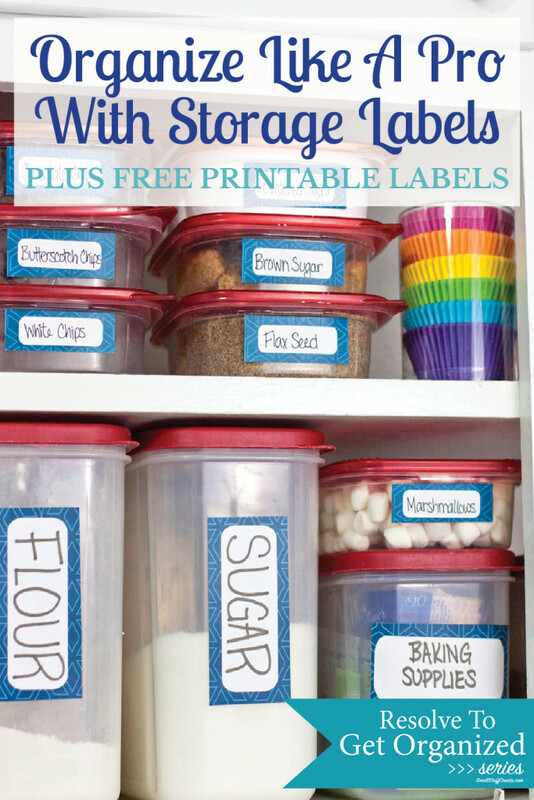 You can download a free printable of my blue labels in this blog post. 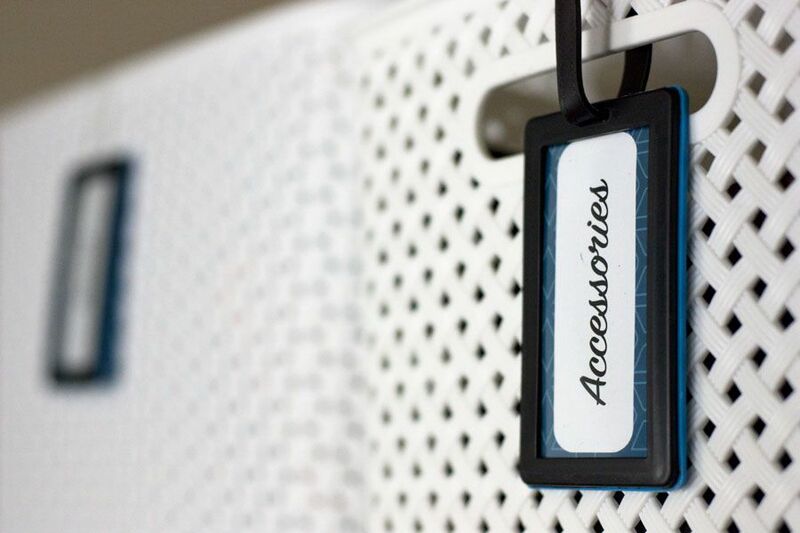 I inserted them into some luggage tags and attached to the baskets. I am a thrifty gal, but making over an entire room does take some money. 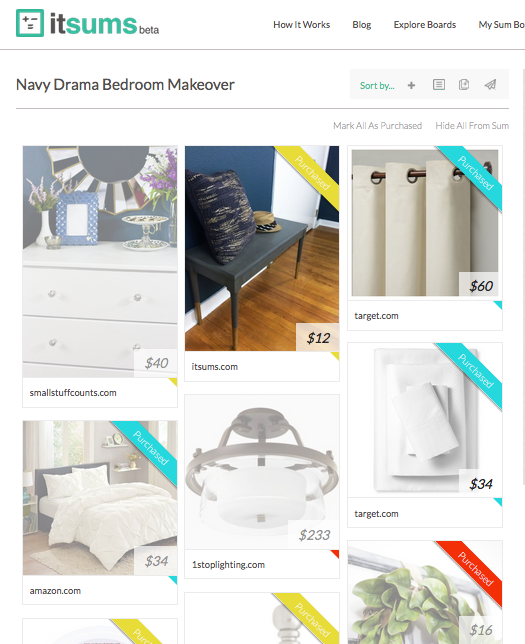 So I set aside a budget and planned out our entire room with the help of the most amazing site for budgeting projects – Itsums. You can check out my project budget and find links to all of my product sources on my Itsums board. If you have a decorating project on the horizon, I’d highly recommend using this site to keep track of your expenses. Many things in this room are DIY projects. I’ve compiled the tutorials here in one place for you. I have several more to write over the next few weeks, so I’ll continue to update this section as I write more tutorials about everything in this room. Thank you to 1STOPLighting, Merely Modern and D.Lawless Hardware for providing fabulous products to complete this room makeover. They are amazing! And thank you for taking the room tour today, and for cheering me along during the past five weeks. It went fast, but I’m so happy with the end result. What’s your favorite feature in the room? 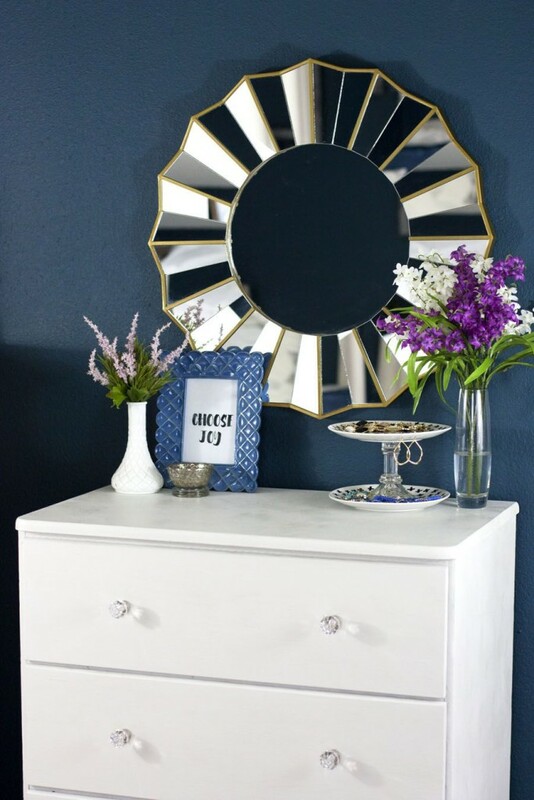 If you can’t get enough of great before and after room tours, be sure to visit all of the other bloggers sharing their One Room Challenge makeovers today. Wondering how I plan out a room makeover? 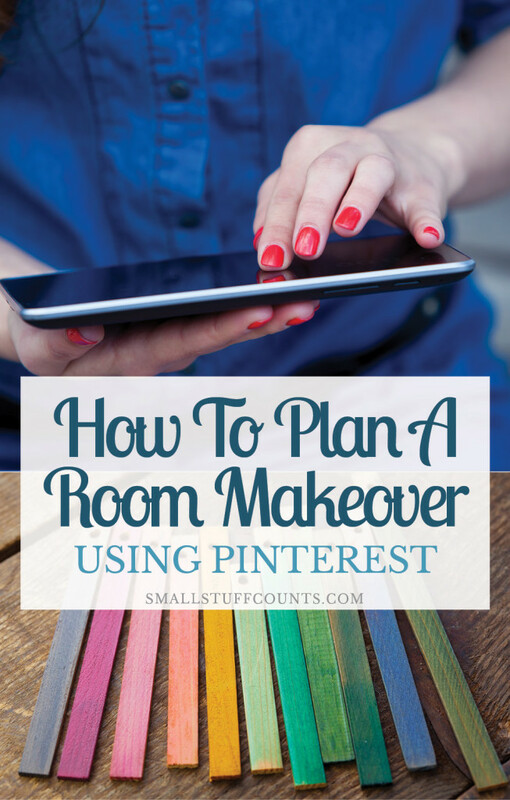 Learn my method for planning a room makeover using Pinterest without getting overwhelmed by all the pretty pictures. 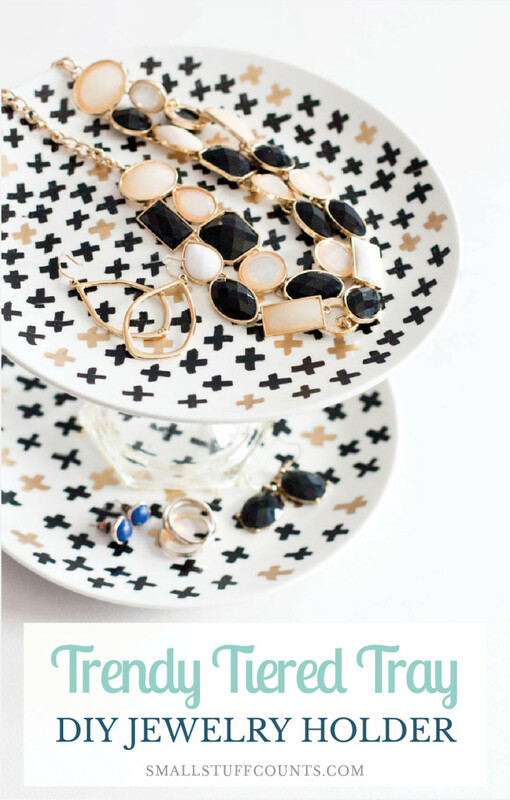 I’ll show you how I collect ideas and inspiration and turn them into a cohesive decorating plan. What a dramatic improvement! 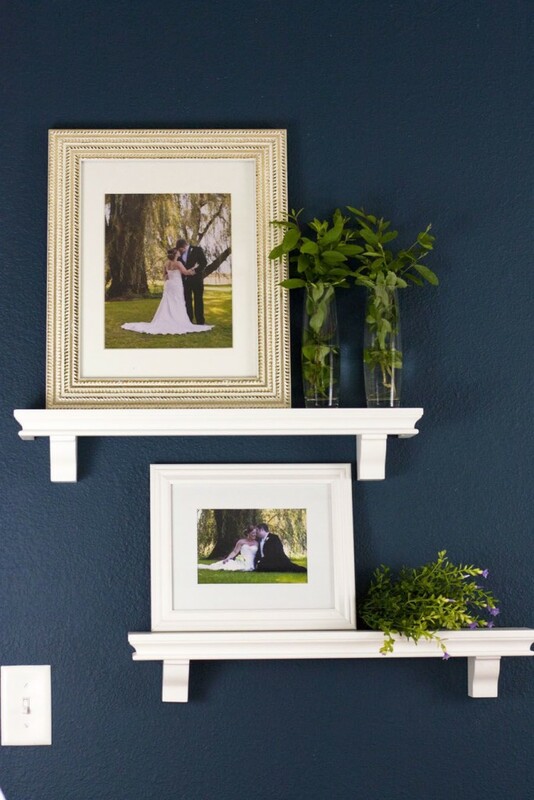 I love the wall color and you can never go wrong with classic blue and white! My favorite feature is the bed. I really like the comforter and the throw pillows. The small white pillow looks good because the triangles in the design really tie in with the stitched design on the comforter. I also really like the grey with the blue and white. Your bedroom looks so elegant now. Simply beautiful! 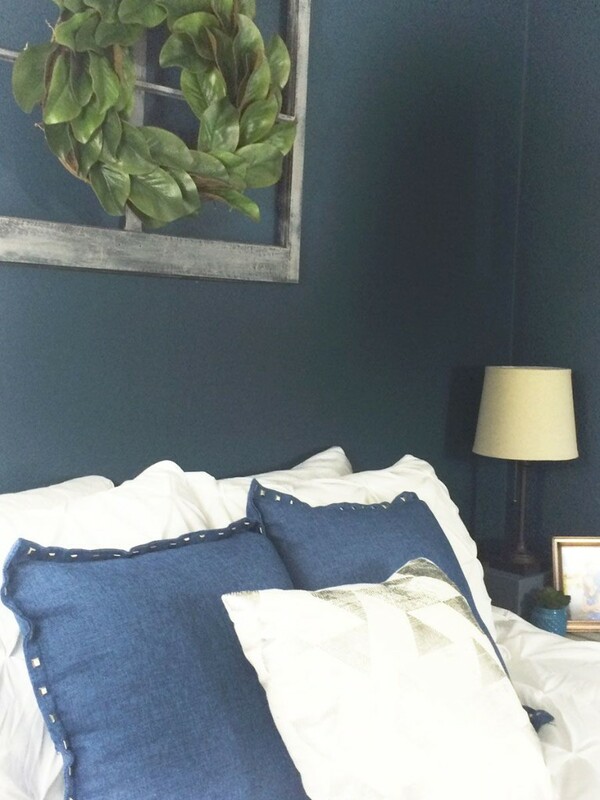 I love the navy and gray pallet you got, and the room feels like a cocoon for relaxation!Congratulations and CHEERS to us for another room done! What an amazing makeover! I am just in love with everything you did to this room! 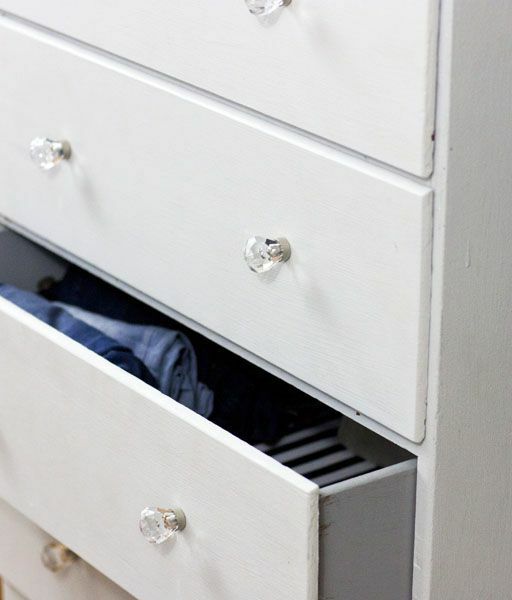 From the lighting to the dresser drawer pulls, every detail is just spot on. And that color is gorgeous! I am in the middle of making over our master bedroom, and your before and after pictures are just so inspiring. Very very nice!